The RFH series has been discontinued. Please contact our Flow Engineering Department. OMEGA’s RFH Series of refractometers are instruments that determine the concentration of an aqueous solution by measuring its refractive index. All waterbased solutions can make light bend. The bending of light increases at a rate proportional to the increasing solution concentration. 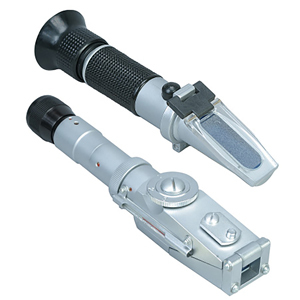 The handheld refractometer is a precise optical instrument. It is small, light, needs only a few drops of solution to take a measurement and is very user friendly. Refractometers are used throughout the food, agriculture, chemical, and manufacturing industries. Our analog and digital refractometers are among the finest optical instruments in the world. We offer a complete line of refractometers that are suitable for all applications: Brix (Brix Scale = number of grams of cane sugar dissolved in 100 ml of distilled water), alcohol, propylene glycol, protein in serum, salinity, specific gravity, industrial fluids, refractive index (nD), along with many other scales that provide the user with limitless flexibility. The RFH101 thru RFH107 and the RFH112 thru RFH114 are ideal for monitoring sugar concentrations in foods and beverages. Some common applications are controlling ripeness of fruit in the field and measuring fruit juices, wine, honey, soft drinks, and industrial fluids. The RFH200 Series is ideal for the measurement of salinity, saltwater, and brine, and for food processing and canning applications. The specialty refractometers have a wide range of applications, from ethylene and propylene glycol to proteins. 참고: Comes with cleaning cloth, suction tube, screwdriver, carrying case and complete operator's manual.